In a welcome change of direction, Tim Burton downplays his typically outlandish style for Big Eyes, a sunny and well mounted, yet disappointingly thin 1960s biopic. 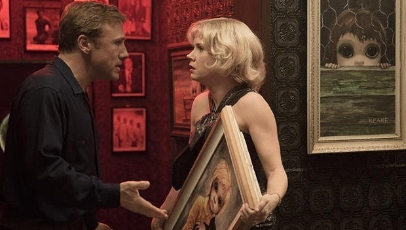 Wannabe artist Margaret Keane (Amy Adams) up sticks and moves to San Fransisco, where she soon falls for Walter (Christoph Waltz). But when Walter starts to pass off her paintings as his own, making thousands in the process, things soon turn sour. The film, shot with a sense of optimism by cinematographer Bruno Delbonnel, unravels at a steady pace, becoming increasingly frantic and hot-blooded as Margaret discovers what Walter’s been up to and pushes herself to fight. There’s heavy themes bubbling under the surface throughout – from gender politics to the line between high art and low art – but the screenwriters seem reluctant to inject too much darkness into the film. Adams captures Margaret’s initial quietness well, and her slow but steady emergence is fascinating to behold. Waltz, meanwhile, is his usual fiery self as Walter. It’s a strong performance, but also one that overshadows large portions of the film. Whatever its flaws though, Big Eyes is never dull. It’s an interesting story, and Burton’s admirable restraint allows that to remain front and centre throughout.